Villathis property is a characteristic and welcoming apartment surrounded by meadows and by green hills. It sleeps four people. From Villathis property you will enjoy a breathtaking view of the greenery and of the hills. Villathis property is 75 square meters (810 square feet). It features a shared swimming pool, a shared garden, a reserved outdoor area, winter heating and WI-FI Internet access. You will be roughly 7.5 km (4.7 miles) from Castiglion Fiorentino, where you will find restaurants and shops. Villathis property is located on the top floor of an ancient farmhouse. You will reach it from the parking area going up a route that cuts through the garden and includes approximately 26 stairway steps. To stay at Villathis property you will need a car. You will be able to park it free of charge inside the entrance gate. Villathis property is one of the holiday homes available in a small complex. Please find a general description of the complex below, and please scroll further down for a description of Villathis property. The swimming pool is 6 meters (20 feet) large by 12 meters (39 feet) long. The area is equipped with sun umbrellas and sun loungers. From the swimming pool you will enjoy a broad view of the garden. You will share the pool with the other guests staying at the complex. The swimming pool is open from mid-May until mid-September. The garden is 3000 square meters (32300 square feet) large. It is partly shaded by imposing trees. In the garden you will find a barbecue. From the garden you will enjoy a charming view of the greenery and of the hills. You will share the garden with the other guests staying at the complex. The living room is paved with terracotta tiles. The ceiling has characteristic exposed wood beams. The furnishings are in the traditional style of the Tuscan countryside. The furnishings include a sofa. The dining table can accommodate four guests. The room has two windows with a view of the greenery. The room also has a roof window. You will be able to enter the kitchen from the living room. It is equipped with a four-burner gas cooker, an electric oven, a refrigerator with freezer, a dishwasher and an Italian-style coffee-maker. The dining table can accommodate four guests. The kitchen has a window. You will be able to enter the first bedroom from the living room through an access area. The bedroom has a matrimonial bed (160 cm/62 inches, wider than a queen-size bed). The room has a window. You will be able to enter the second bedroom from the living room through an access area. It has two twin beds (80 cm/32 inches). The room has a window. 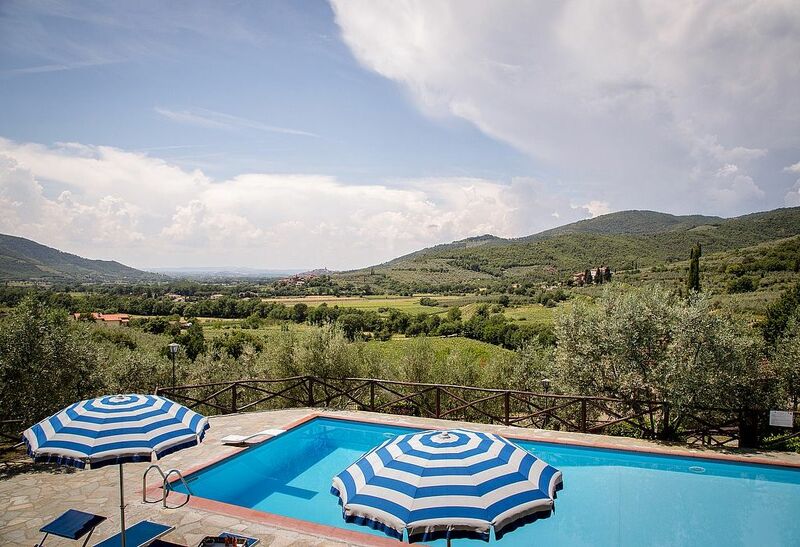 This villa, in Sant'Enea, boasts a gorgeous valley view sleeping 4 people. The villa offers superb accommodation, including modern luxuries such as a community pool and internet access.